The Burma Rivers Network (BRN) made the following statement on that date: The BRN is encouraged by news that President Thein Sein plans to stop the construction of the Irrawaddy Myitsone Dam, but urges the people of Burma to demand an official declaration and pull-out of all personnel and equipment from the dam site by the project-holder, China Power Investment (CPI). BRN also urged continued pressure on the military government (before the democratic change) and the CPI to immediately cancel the other 6 mega-dams planned on the Irrawaddy source rivers, which will have the same devastating impacts on the country. This seemed to be in 2011 a success story in stopping a very large dam already under construction and scheduled for completion in 2019 in the upper reaches of the Irrawaddy River, the life-line of Burma. The dam is located in Kachin territory, an ethnic group which has often been in armed rebellion against the state. However in March 2014, as Peter Hadfield of The Guardian reported, the dam was not stopped. Villagers are exiled from ancestral home as the fate of dam remains unclear. The Myitsone dam project lies unfinished but not dead in Kachin state, northern Burma, caught in a tug of war between the Burmese Government and a powerful Chinese corporation. 12,000 Kachin villagers, remain in exile as a political and military drama plays out over the fate of the dam. It was a project conceived, financed and – so far partially – built by the state-owned Chinese Power Investment Corporation (CPI), to take electricity across the border and help industrialise the Chinese province of Yunnan. At 152 meters high and with a potential capacity of 6,000 MW of electricity, the Myitsone was to be the largest of seven dams at the headwaters of the Irrawaddy River. If completed, it will be the 15th largest dam in the world. But soon after work started in 2009, the project ran into trouble. 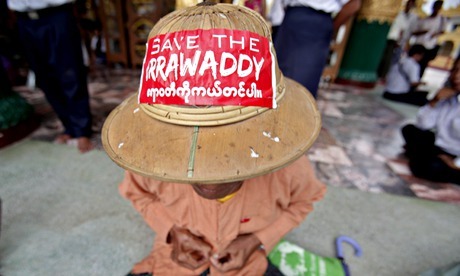 Environmentalists objected because the Irrawaddy is Burma's most important water resource, supporting a thriving fishing industry, irrigating Burma's rice bowl, and supplying silt to the Irrawaddy delta. Environmental group Burma Rivers Network is worried that China will eventually get its way, as it has with so many other projects in Burma. A local said to the Guardian journalist: "I think pressure from China will be too strong," said Ah Nan, a spokesperson for the group. But she adds that even if the project restarts the Chinese still face a problem. It will be difficult to send material to the dam site, because they'll be sending it through a war zone. And this kind of development is only fuelling the conflict" . The dam is planned at a short distance away from the birthplace of the Irrawaddy River, at the confluence of two rivers considered a sacred place. The reservoir would submerge important historical and cultural sites at the Mali and N'mai Hka rivers that together make the Irrawaddy. The projected dam is located in a region that is recognized as one world's biodiversity hotspots and a global conservation priority. The jungle area that was to be flooded contains bears, leopards, elephants, red pandas and many species of monkeys. The river contains a threatened dolphin species. The Myitsone Dam is part of the Confluence Region Hydropower Project (CRHP), which includes seven dams with a total installed capacity of 20,000 MW. The dam was expected to flood 447 km2 including 47 villages near the construction site and about 12000 local people would be relocated in the resettlement villages. The Kachin activists in exile stated that the dam would submerge historical temples, churches and cultural heritage sites important to Kachin identity. Why? Explain briefly. It seemed in 2011 that the project would be cancelled, but reports in 2014 say that it is going ahead despite Kachin complaints.